Experience the best that Botswana has to offer on our comprehensive safari tours of this wildlife-rich African Eden. Botswana is inherently safari country. More than 17% of it consists of protected wilderness in the form of game reserves and national parks, and the government is fiercely dedicated to conserving its natural spoils. There is great emphasis on eco-tourism, particularly in environmentally sensitive areas like the Okavango Delta. If you are a nature enthusiast, Botswana will undoubtedly speak to your soul. The country is immense, and therefore able to offer striking diversity. There’s the semi-arid Kalahari with its rolling dunes and open grassland, the otherworldly Makgadikgadi Pans that stretch out flat and far as the eye can see, and the Okavango Delta, drenched in waters that sustain a wealth of wildlife. Botswana is also the best place in the world if you’re looking for high concentrations of elephants. These magnificent giants flourish all over the country, from Chobe to the delta. As a safari tour destination, Botswana is not the most affordable to visit. Safari lodges are remote and often pricey to reach. The US dollar is the currency of choice, eliminating the opportunity to take advantage of a favorable exchange rate. If it is within your budget to visit, however, you will not be disappointed. This is a safari destination that crawls under your skin, assaults your senses and captures your heart. Below is a selection of our most popular Botswana safari tours. They range from packages offering great value to extravagant journeys where no luxury is spared. Accommodations have been carefully chosen for the best game viewing opportunities possible, and trip durations plotted for most fulfilling experiences. Botswana’s elephant-rich Chobe National Park is the focal point of this ‘short-but-sweet’ safari tour. Second in size only to the sprawling Central Kalahari Game Reserve, Chobe is one of the country’s most significant and rewarding wilderness areas. It also happens to be the most accessible, and removing the necessity of costly charter flights ensures fantastic value for money. Game viewing in this part of the world is nothing short of exceptional. This is very much the ‘Africa’ that has captured your imagination; one of vast herds, rolling floodplains and a colossal water source that teems with wildlife. 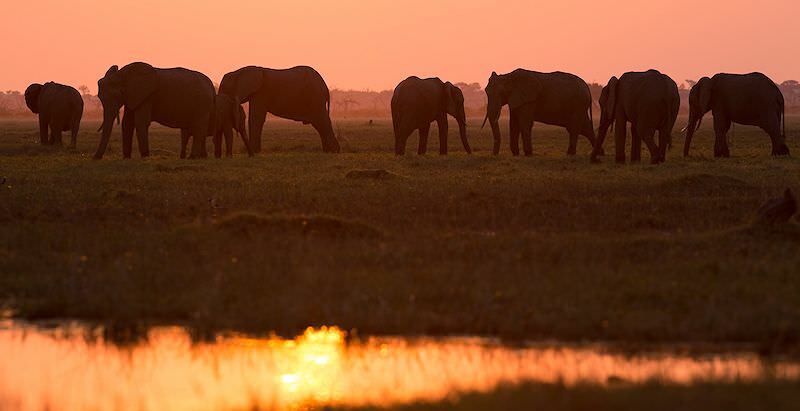 Chobe is, in fact, a sought-after destination for its water-based game viewing, particularly sunset river cruises. Gliding along this prolific African waterway while the sky shifts from vivid reds and oranges to dreamy pastels is an experience that will stay with you for a lifetime. You’re very likely to come across hippos, crocodiles, elephants and herds of plains game ambling down to the water’s edge for a drink. Traditional open-air 4x4 game drives are naturally also included, typically conducted in the early morning and late afternoon. Use the opportunity to look out for buffalo, lions, leopards and African wild dog. Rare antelope species that thrive in the park include puku, Chobe bushbuck, sable and roan antelope. You’ll be staying at the five-star Chobe Game Lodge, which enjoys a prime riverfront perch within the park itself. Accommodation is full board, meaning that your meals and safari activities are conveniently included in the price of your package. An attractive bonus of this comprehensive little package is the fact that, rather than flying you directly to Kasane in Botswana, we’ve included return flights to Livingstone in Zambia. Chobe National Park is a hop, skip and a jump from the world-famous Victoria Falls, and you’ll enjoy a short tour of this world wonder en route to the park. Along with the Serengeti and the Kalahari, the Okavango Delta is one of the most storied wilderness areas on the continent. Every experience seems as if it were ripped straight from an Attenborough documentary; the sightings just have remarkable production value. Three nights and four days in this African Eden will replenish the world-weariest soul. You’ll travel via commercial flight from Johannesburg to Maun, where you will board a light aircraft for the final leg of your journey (luggage restrictions apply). This is an adventure in itself, and the aerial views of the delta before touching down on a local airstrip will undoubtedly take your breath away. 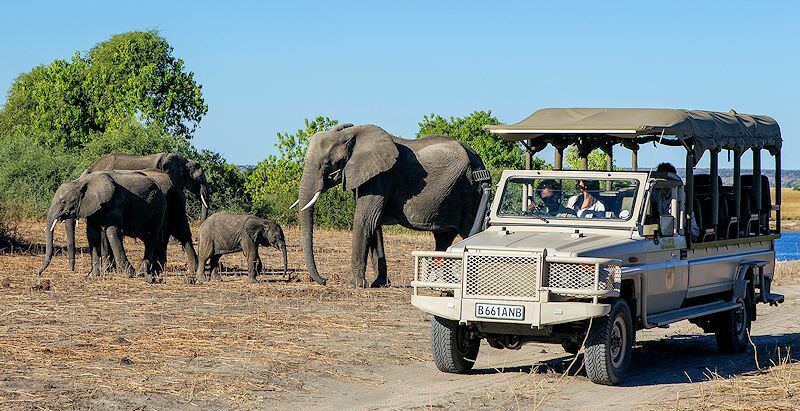 The camp included in this Botswana safari tour – Camp Moremi – has been selected for its ability to offer both land- and water-based safari activities. It is always highly recommended that, if the Okavango Delta is your only safari destination, you should select an accommodation that can support both activities to ensure the best value and the most varied sightings. You’ll enjoy comfortable lodgings in luxury safari tents on raised platforms, enhanced with bewitching views across the Xakanaxa Lagoon. Accommodation is full board, including motorboat safaris on the lagoon and open-air 4x4 game drives. Prospective travelers often wonder at the price of Okavango Delta safaris (and the level of luxury available) versus luxury safaris in South Africa’s wilderness areas. What is important to keep in mind is just how remote the delta is and, in relation to that, how costly an enterprise it is to ensure that each property is well-stocked and managed for discerning guests. Moreover, there is a great emphasis on eco-tourism, discouraging the establishment of permanent structures and encouraging the use of natural materials. Comparatively, you will not have the same lavish experience in the Okavango Delta that would in, say, the Sabi Sand, for the same price. However, you will be absolutely immersed in one of the most captivating wilderness areas in the world – authentically wild, painfully beautiful and full to the brim with all walks of wildlife. Exploring the delta is a privilege that you really can't put a price tag on. This luxury five-star package offers a comprehensive exploration of three prime Botswana safari destinations; Chobe National Park, the Okavango Delta and the Savute Marsh. As you’ll be flying to Livingstone for the first leg of your trip, you’ll also enjoy a tour of the awe-inspiring Victoria Falls. Chobe is first on the safari agenda, and really does offer a striking introduction to Botswana. The park’s vast floodplains support a wealth of wildlife, and it is particularly famous for its elephant population (the highest concentration of these giants in the world). You’ll be staying at the five-star Chobe Game Lodge. While more of a hotel than a lodge in terms of its size, one of the great benefits of this accommodation is that it is the only permanent property within the park itself. While other safari enthusiasts will be queuing to gain access at the park’s gates in the morning, you’ll be able to relish a head start and get right down to game viewing. Three nights are spent in Chobe, where you’ll be able to encounter four of the Big Five (no rhino), African wild dogs and a range of rare antelope species. The highlight of your stay will likely be the sunset river cruises – an ocular overload that combines scenes of ample wildlife with sunsets unlike anything you’ve experienced before. After a last game viewing activity in Chobe, you’ll be transferred to Kasane for a charter flight to the Savute region of the park. The Savuti Marsh is arguably the most underrated safari destination in Botswana, and inherently unique. The Savuti Channel has flummoxed geologists and other researchers for years, as it appears to flood and dry up independently of decent rains or flood levels elsewhere. When the river is in flood (like it is now), it draws an astonishing amount of wildlife (including the second largest zebra migration on the continent). Savute Elephant Lodge is perched right on the channel. 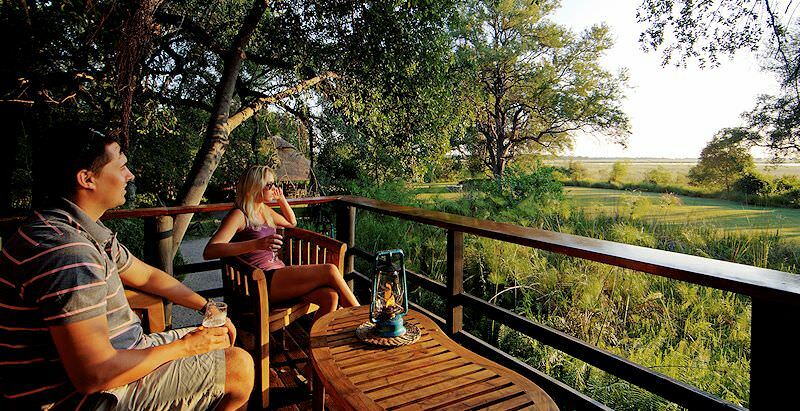 During your three-night stay, you’ll be able to observe wildlife directly from the deck – especially elephants. Accommodation consists of plush safari tents fitted with four-poster beds and other creature comforts. Safari activities include your traditional 4x4 game drives along with unique extras like heading out to the ancient baobab cluster (13 giants!) and viewing San rock art paintings dated older than 1 500 years. Your last port of call is the legendary Okavango Delta, reached by another charter flight directly from Savuti. You’ll unwind at a water-based camp – Xugana Island Lodge – for three nights and four days, discovering the secrets of the delta via mokoro rides and guided bush walks. Without the whir of motors and engines, your game viewing experience will be quite organic – an opportunity to truly tune out of civilization and into the intimacies of nature. The 12 Day Botswana’s Finest & Falls Safari is our most exclusive Botswana-based safari tour offering. 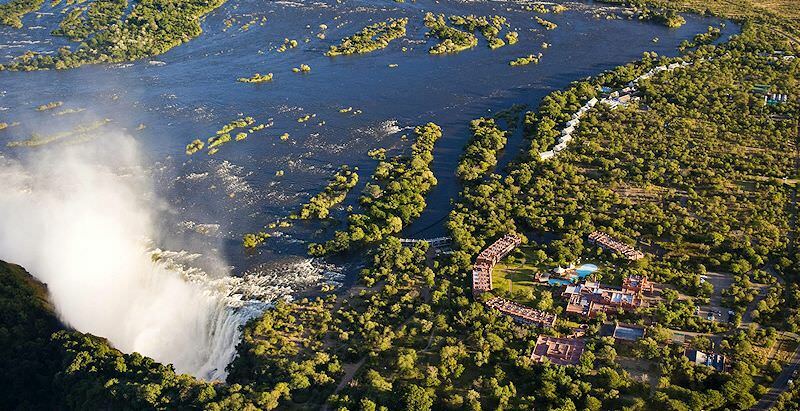 In addition to staying in the top lodges in three distinct safari areas, you’ll also spend two memorable nights within view of the dancing cloud spray of the Victoria Falls. You’ll start at one of the most remote and unique safari destinations in the country – the Makgadikgadi Pans. These pans - more than 16 000km2 in extent – are the remnants of what was the greatest lake on the continent millions of years ago. The pans are bone dry and sparsely populated with wildlife, but if you’re visiting after the rains, you’ll find this flat, lunar landscape transformed by rosy clouds of (literal thousands of) greater flamingos. The shallow lake also draws massive migratory herds, particularly of zebras and blue wildebeest, which in turn draw predators like lions, cheetahs and brown hyenas. If you’re visiting when it’s dry, you’ll be able to enjoy activities like quad biking across the pans, visiting the baobab-peppered Kubu Island, and embarking on an educational excursion with local San bushmen. Alternatively, relax in the cool reprieve of the pool at Jack’s Camp – an oasis in a dramatically arid environment.